Abydos was the principal cult centre of Osiris. From the Old Kingdom (about 2613-2160 BC) onwards, it became the expressed desire of an Egyptian to visit Abydos and to be commemorated there. The practice reached its peak during the Middle Kingdom (2040-1750 BC). In the 1820s and 1830s stelae were extracted from Abydos in vast numbers by Giovanni d'Athanasi and Giovanni Anastasi, in what has been called a 'quarrying or mining operation for inscribed stones'. Recent research has shown that many of these stones were not simply erected haphazardly by pilgrims and visitors, but were arranged in chapels in various parts of the site, with concentrations around the area of the main Osiris temple (Kom es-Sultan in Arabic). The chapel would typically contain a table on which offerings could be made to the deceased in the presence of Osiris. Reconstructions have suggested that one chapel might contain several stelae of different styles, showing the owner of the chapel, his spouse, relatives and dependants. This stela bears conventional prayers for offerings for the tomb owner, Heqaib, and four figures, two of himself and one each of his mother and father. 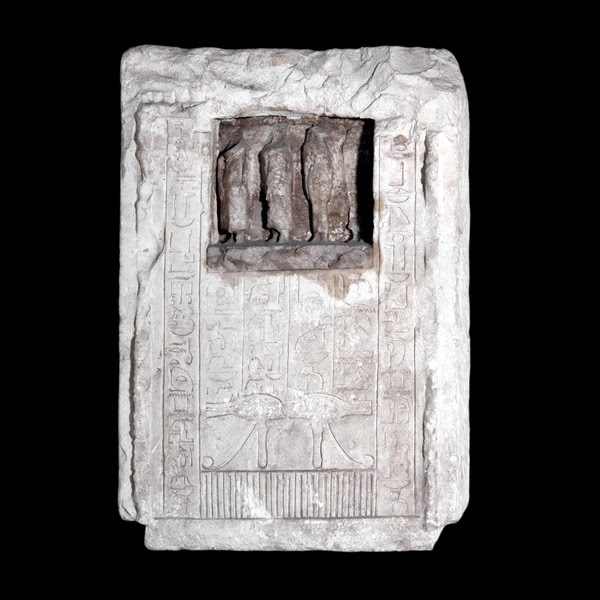 The four statues are carved in a separate piece of stone, which was then inserted into a recess left in the stela. Perhaps the sculptor felt that the stone used for the stela was not suitable for the detailed carving, or that it would be easier to carve if it were arranged this way. Stelae with deliberate niches for statues are known, but this arrangement is rare.